No matter what your age, come and decorate a range of blank pottery at the ZULU LULU ART BAR. The Art Bar is a fun place to meet and get creative in a relaxed casual environment. Bring the kids, your friends and family. No person is too young or too old. And there’s no booking necessary for individuals or smaller groups. Select a blank pottery item off the shelf in the Art Bar. Each item is individually priced to include all the paints and studio glazing. We provide the brushes and palette of special ceramic paints. Choose your space either indoors – or outdoors on a lovely day – and enjoy your creative time. 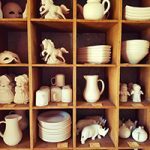 We return your painted item to our studio for glaze firing before being returned for you to use and enjoy. Collect back from ZULU LULU ART HOUSE a week or two later, or have us package and post directly to your door. Too impatient to wait for ceramic ware to be glazed and fired ? 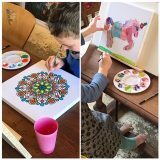 We also have Mandalas pre-printed onto canvas that can be painted with acrylic paints and taken home with you. You can also paint your own canvas from scratch. No experience needed, just come and create !